Rachel Corrie. She’s the one with the megaphone and the hi-viz vest, in case you couldn’t spot her. Image via ibtimes. 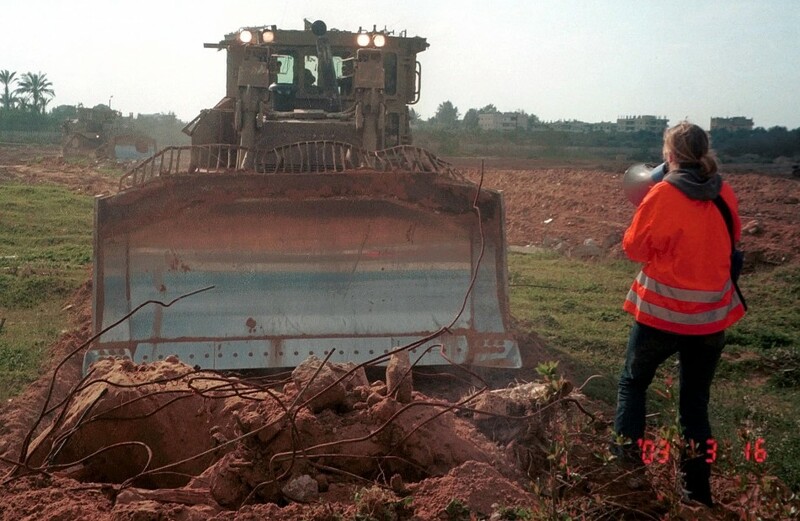 The above photo shows US activist Rachel Corrie standing in front of an Israeli bulldozer as it tries to demolish Palestinian homes in Gaza in 2003. Later the same day, Corrie was killed after being crushed by, you’ll never guess what… an Israeli bulldozer. Having spent the last nine years seeking justice for Rachel’s death, her parents brought a civil claim against the Israeli Ministry of Defence for negligence, but this morning an Israeli court ruled that the state of Israel was not responsible for her death, that it was a regrettable accident but had taken place during ‘wartime actions‘ while Corrie was “protecting terrorists in a designated combat zone.” Oh, and the bulldozer guy didn’t see her. It’s difficult to work out which of these myriad excuses is most offensive to her memory. But if you’re one of those who feel that the whole thing would never have happened if she hadn’t been there, think about the quote above. If a young woman from Washington believed in a cause so strongly she was prepared to put her life on the line for it, the least the rest of us can do is pay attention. Bad things can happen when you’re not looking.